The Gear Sport does not have speakers. All audio is played through a paired Bluetooth device. 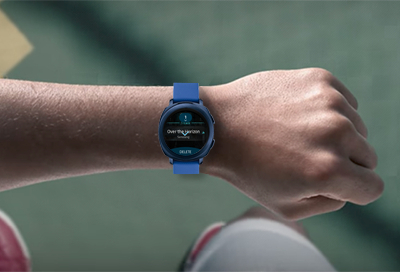 Transfer music from your phone to your Gear Sport and play music right from your wrist. It's time to experience the freedom of a wireless, phoneless, and practically weightless exercise sesh! Screens and settings available may vary by wireless service provider and software version. The Samsung Gear app must be downloaded on the mobile device. Get ready to get pumped up at the gym with your favorite tunes! Play music on your phone or play stored music straight from your Gear Sport. Whichever way you prefer, we make it a cinch. You can also stream music on Spotify by downloading the app from Galaxy Apps. You've got several ways to tune in while you stay on track with your workout. 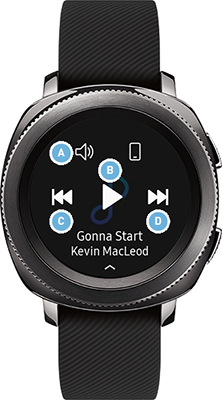 To listen to music stored on your Gear Sport, you must connect a Bluetooth headset first. • A. Volume Control: Set the volume level. • B. Play/Pause: Start or pause the track that is playing. • C. Previous Track: Go back to the previous track. • D. Next Track: Skip to the next track. Got a killer new playlist? We make it easy to transfer music from your phone to your Gear Sport, so all you have to do is feel the beat. 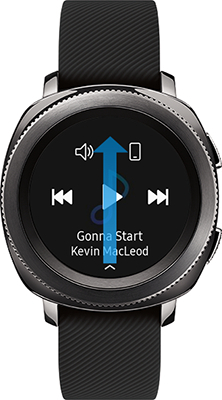 1 Navigate to and open the Samsung Gear app on your mobile device. 3 Touch Send music to Gear. 5 Select the songs you want to import by touching the check box, and then touch DONE. You can also turn on Auto sync which will automatically sync selected playlists from your phone to your Gear Sport. 6 From your Music Player, swipe up on the arrow. Touch a category to find the music you've sent. Deleting music from your Gear Sport is totally simple. Just touch and hold any song title in the Tracks library until DELETE pops up at the bottom of the display. Touch DELETE, and the track will be deleted. It's easy like Sunday morning.